If you manage your intergalactic business properly, invading and destroying some planet on your way is a piece of cake. All you might need is hyperactive gigantic squids or good old flying saucers with powerful blasters. That’s it! Off we go! Apocalypses starts here! 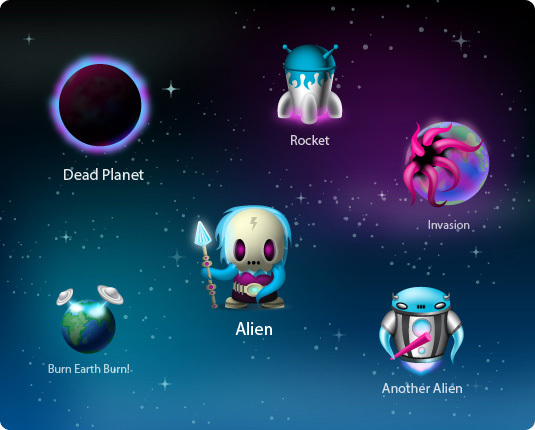 Despite the horrendous threat to the whole mankind Turboillustrator Eugene Artsebasov drew a set of icons featuring space invaders. A new gaping visitor of our site might murmur: "Have you all gone nuts in your Turbomilk? What’s with the aliens?" This is an easy question! These are freeware icons that serve as training aids for icon design.